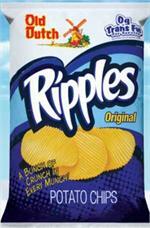 Old Dutch Original Ripples have the special taste you've always loved. They're rippled, crispy, and simply delicious. Ingredients: Potatoes, Sunflower Oil and/or Canola Oil, Salt.